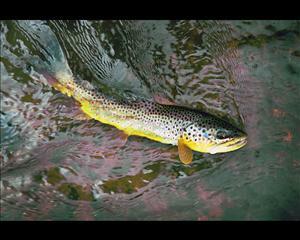 Description: A small stream full of wild brown trout. Middle Michigan Creek is a high country meadow stream, replete with oxbow bends and open casting. It is an excellent choice for novice flyfishers and children, but experienced anglers will find enough casting challenges and larger fish to please them as well. There is also a lovely home located in South Park that the landowner is willing to lease for two nights or more. Location: From Denver drive south on Hwy. 285 to Jefferson. The property turn off is 2 miles past Jefferson. The distance from Fairplay is measured from the Como turn off which is 4.8 miles to the ranch entrance on the left. Capacity: 3 anglers or more if all in one group.